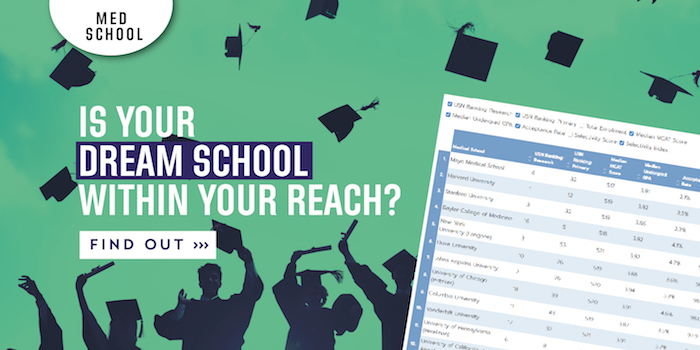 On this week’s show, we shine a spotlight on a great resource for premed students – both students deciding where to apply, and those students in the happy position of deciding among multiple med school acceptances. A site that gives you tons of data on medical school placement i.e. results — where graduates of specific medical schools go both geographically and in terms of residency placement. And a few other statistical pieces too. Currently M2s at BU. Evan attended Williams College where he earned a bachelor’s degree in chemistry in 2013. Anthony attended Boston College. He too graduated in 2013 with a degree in biology. They’re both hockey players. It’s the first service to compare med schools based on their success rates in the residency match. They use match lists, NRMP data on acceptance rates, etc., to rate schools on their performance year to year. Students can see and contrast schools’ success at placing residents in very competitive residencies, for example. MedHounD costs $9.99 for a 1-year subscription. You can use it to identify schools during the application process (helpful if a student has a goal in a particular specialty and wants to know placement outcomes). And it can also help students make enrollment choices when they’re evaluating multiple offers. Evan: The idea came during the application cycle. He had narrowed his choices to two schools, and researching the match outcomes of both schools helped him make his decision – the data was helpful. Before entering med school, he created a prototype with just a few schools; he and Anthony were roommates their first year and decided to build MedHounD. Analytics also factored into Anthony’s decision to attend BU: he weighed location, etc., but also considered match lists. Anthony: Med school has complicated the decision-making process. He’s looking to 3rd year rotations for firmer goals. Evan: Started medical school thinking of surgery (not sure what specialty). He’s still leaning in that direction, but also looking to 3rd year rotations to help shape his decision. In short, yes. Knowing schools’ track records is helpful information. Yes. Right now they’re working on making it easier to compare schools using their tools. But they plan to collect user data year-to-year – including GPA, MCAT, etc. – so students can see where they fit. It reflects the percentage of students who do their residency at the same place they went to med school – they see this as a gauge of how happy med students are at their institutions and teaching hospitals. Because they sniff out data like a hound – searching for deep info to help students make informed decisions. And for Hank, Anthony’s dog. Evan: Be rigid about weekly goals, but flexible about which activities take precedence day to day. And set reasonable goals. Evan: Writing the personal statement & essays, traveling to interviews—time management (balancing applications with school). And waiting. Keeping your head in the game and staying positive while waiting for news. Anthony: The financial aspect can be tough – the application costs, travel, etc. For essays, the character limit for secondaries was challenging. The waiting game was definitely tough. It can be hard to get information. Evan: Worked for Match Corps as a middle school tutor/teacher for a year. Learned a lot! Education is definitely important for medicine, so it was a valuable experience and cemented his med school goals. Anthony: Conducted clinical urological research. Worked with residents and fellows –his work resulted in presentations and publications, and made med school more relatable. Anthony: Compare yourself to an actor – who would you be? Evan: What are your top 3 weaknesses? Anthony: Med school is not easy – it can be overwhelming. Make time for life – family, gym, etc. Don’t get overwhelmed by the pace. Evan: Keep in mind that it’s a process – don’t just think about the destination, but pause and enjoy each step of the journey. Last updated on January 19, 2017.